Hello everyone, my wife and I collect thimbles and recently bought 3 thimbles with the backstamp of White Heron, Fine Bone China, New Zealand. They are Australian State Floral Emblems (see photos) and we are currently researching the internet for information without much success. I believe the thimbles were made in the 1980's and come boxed in camel coloured, hinged boxes. Any help at all would be wonderful. This one shows the base stamp ... a bit blurry .. I will do a saved search and let you know if any turn up. Gosh I would really like to see the NSW thimble with the Waratah ! I have seen a picture of a 4th one in Sue Gowans updated CD. I also have it in my mind that there were thimbles made with NZ decoration....flowers I think. In a week or so I'll post a photo of some of our display shelves with just some of the more than 1,200 thimbles we've collected so far. I have collected NZ thimbles since reading Sue’s book back in 2000 and being inspired by her Australian research. I have been in contact with Sue over that time but out of action for a few years recently with family matters. Last night I did a Google search of NZ thimbles and stumbled on your old query thread. I have several White Heron Thimbles and two backstamped Hereford. The White Heron have come in the Hereford camel-coloured box as they were also made by Hereford Fine China (Australasia) Ltd in Hamilton. I do not know why there were two brands – maybe just a change of brand when the thimble blank changed? 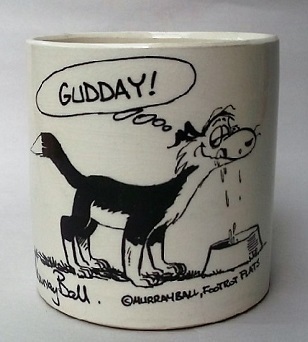 There is now up-to-date information on the Hereford Fine China forum on this site. White Heron: 26 mm high x 17 mm inner diameter. Gold line painted at apex and rim. Apex has honeycomb-patterned dimples. NZ flowers series: I have NZ kowhai, NZ kaka beak, NZ clematis and I think the fourth is pohutukawa. This series has a sprig or bud on the verso. The backstamp is similar to that posted in your original photo. Australian State series: I have a yellow flower that could be an orchid of some kind with four petals the lower one being much larger. There is no writing with the flower nor sprig on the verso. I have two of these and from the distinct differences in detail I am wondering if both these series are hand-painted over outline decal? 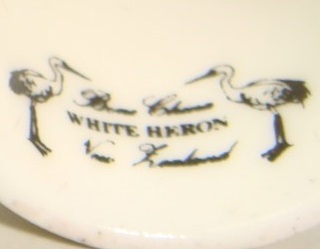 The backstamp is a cursive White Heron encircled with BONE CHINA above and NEW ZEALAND below – no herons. 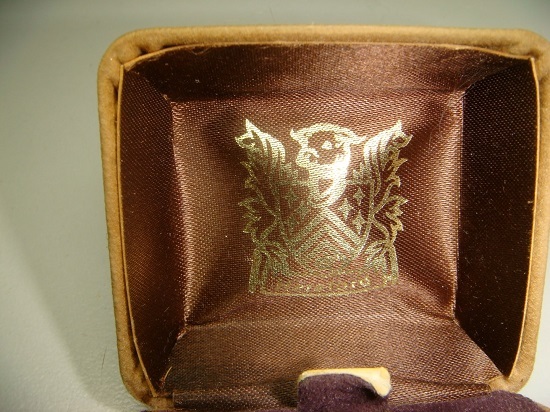 Salvation Army Centennial: THE SALVATION ARMY logo in tan brown with 1883-1983 in a scroll on the verso. There is no gold line at the apex. The backstamp is the same as your photo but quite a bit larger than those in the NZ series. Rose series: I do not have these but saw them on TradeMe archives back in the day when they did not whip the photos off a month after auction closing. There were four different roses: orangey, pink, red, yellow. Hereford: 28 mm high x 18 mm inner diameter so a little heavier than the White Heron blank. Gold line painted at apex and rim. Apex has snowflake pattern in relief which is sometimes painted to highlight this. NZ flowers series: I have NZ kowhai and the pohutukawa. The pattern of the decal of the NZ kowhai is exactly the same as the White Heron one, including the writing and the sprig on the verso but the outline is a much lighter colour. The pohutukawa one does not have NZ in the writing. The back stamp is a larger cursive Hereford with tiny full caps FINE CHINA underneath and then similar print for N.Z. under that. Blanks: These seem to have been available for china painters to purchase as I have a hand painted thimble on the same distinctive blank, and a friend came across several plain white blanks which we have had painted since also. I hope that helps you in your research for your porcelain thimble collection. 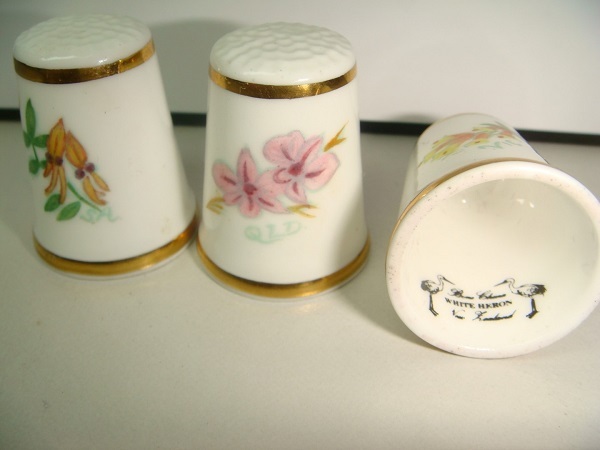 Since my post earlier this month I have been in contact with Sue Gowan, author of Thimbles of Australia, and she has compiled a very useful article of her research for White Heron/Hereford porcelain thimbles which is now uploaded to the "Learn More About" section of her website. I believe it will be of general interest to those collecting either of these porcelains. Thanks for that interesting link kerikerin. We had Rick's wife visit the site and she said that Hereford was starting up again. This was a few years ago now.